O Fat White Woman (1971) is an 80-minute television play produced for the series Play For Today. The play was written by William Trevor and directed by Philip Saville. DD154: "Speech: Fat White Woman treated"
The first tape runs to 21.15 minutes - but it's not music alas. The tape is a recording of a studio session: recording speech for a voice montage and presumably other voice-over sequences used in the production. The tape contains different takes, studio banter and direction from Philip Saville, the Cornford poem and some improvised random dialogue in French. The second tape is the one where Delia comes in - it runs to 10.48 minutes and is principally made up of elements of speech from the studio recording but electronically treated to give them a non-naturalistic, subjective quality. The only music on this tape is some extremely brief fragments of slow organ music at the outset (and by brief I mean 9 seconds!) and then some brief organ chords punctuating the spoken word. Broadcast by the BBC as Play For Today: 4 November 1971. An alternative version of the audio used to be downloadable from MediaFire containing an extra "long Amo Amas Abat" with other, unrelated music appended to it. 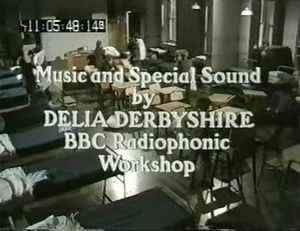 The Delian audio clips are included in the Delia Derbyshire Collection torrent. ↑ From Peter Fiddick's article "Trevor Play" in The Guardian on 5th November 1971, cited in Special Sound, p.140.